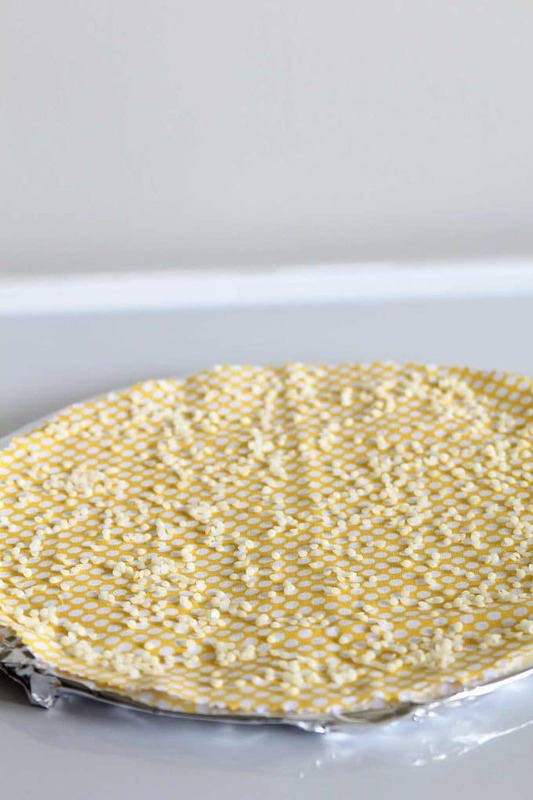 Beeswax food wrap and bowl covers are a simple eco-friendly alternative to plastic wrap. EASY to make, cute and great for summer picnics. I have a thing for bowls. Pyrex bowls, stoneware bowls, McCoy Pottery bowls. And it’s not all about vintage bowls, just about anything able to hold potato salad is my BFF. But it’s a shame to just throw plastic wrap on these bowls when I put them in the fridge or on my picnic table. It seems disrespectful and just plain wrong! So I decided to make some cute DIY reusable bowl covers. And some beeswax food wrap to boot. Now when I started out I thought maybe this would be one of those projects that was going to look cute, but be way too much trouble to actually make very often. On the contrary!!! It’s just about the quickest, easiest project you can do. Plus, since it’s made with beeswax, you’re supporting the local bees. Go Bees! Cover your baking sheet in aluminum foil. Cut out your fabric in the desired shape. I used a large plate as a template for my bowl covers and a tape measure for cutting out the sandwich covers (12×12). 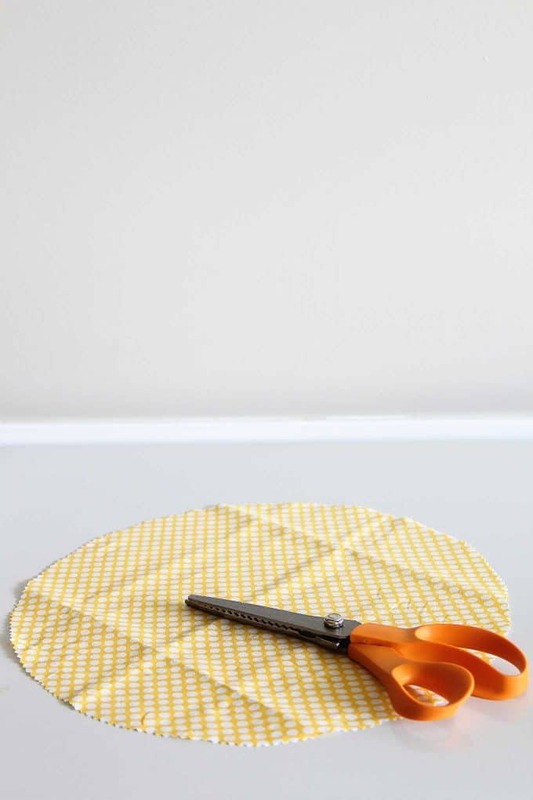 Lay fabric onto the baking sheet and sprinkle beeswax lightly over the fabric. Place baking sheet in the oven for 4-5 minutes. Check to see if the beeswax had melted sufficiently. If there are any un-coated areas, use a paintbrush to move the wet wax around to cover them. Remove the baking sheet from the oven and use tongs to grab the fabric (like I said above, I didn’t use tongs and my fingers are fine, but I’m just going to say to use tongs to cover my behind). 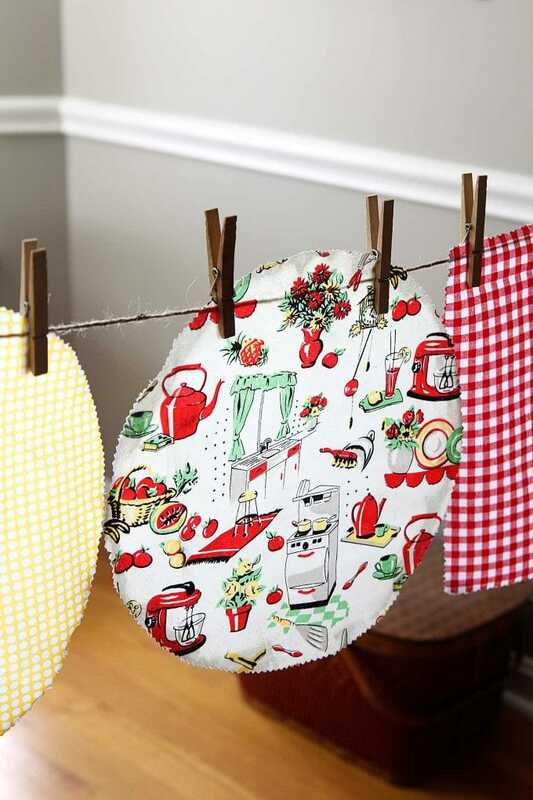 Wave the fabric around in the air to cool (just takes a minute or so) and then you can either hang them in your laundry room to firm up or lay them on a cookie cooling rack. But really, they dry so quickly you don’t have to go nuts about this part. I went nuts on this part. I made a little “clothesline” in my kitchen. 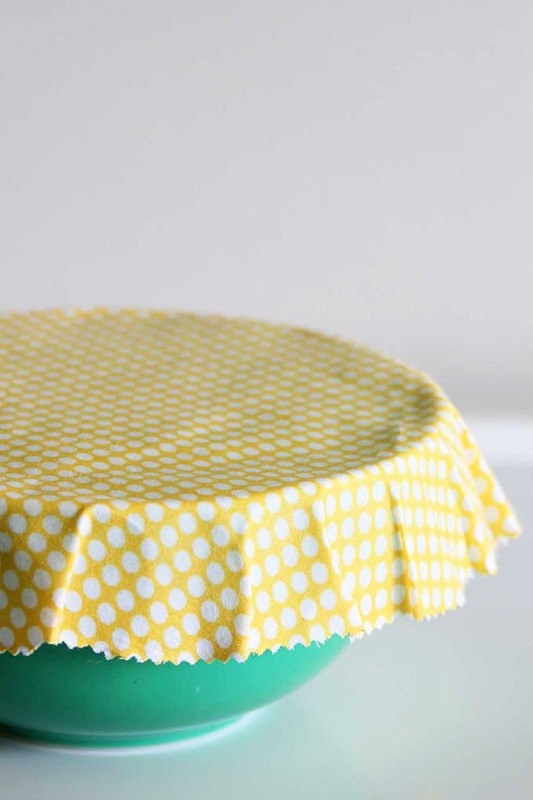 To use your bowl covers, place the cover over the bowl and press it down to the sides. The warmth of your hands will allow the bowl covers to mold to the bowl. For the sandwich wraps, I just wrapped them like I would a Christmas present and used the warmth of my hands to mold it into shape. CONFESSION TIME: I didn’t have any bread or cheese blocks in the house, so that’s actually a pocket-sized thesaurus wrapped up in there. I won’t tell, if you don’t. 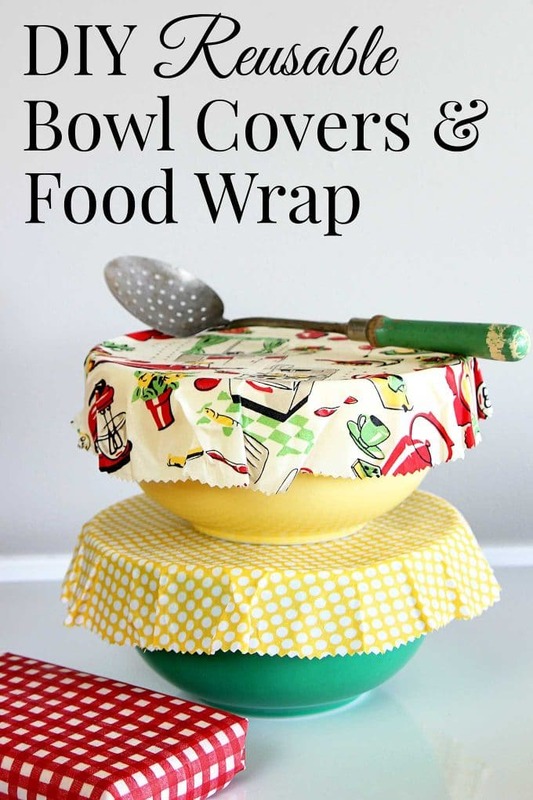 So now that you know how quick and easy these DIY bowl covers and food wrap are, go pretty up your refrigerator! 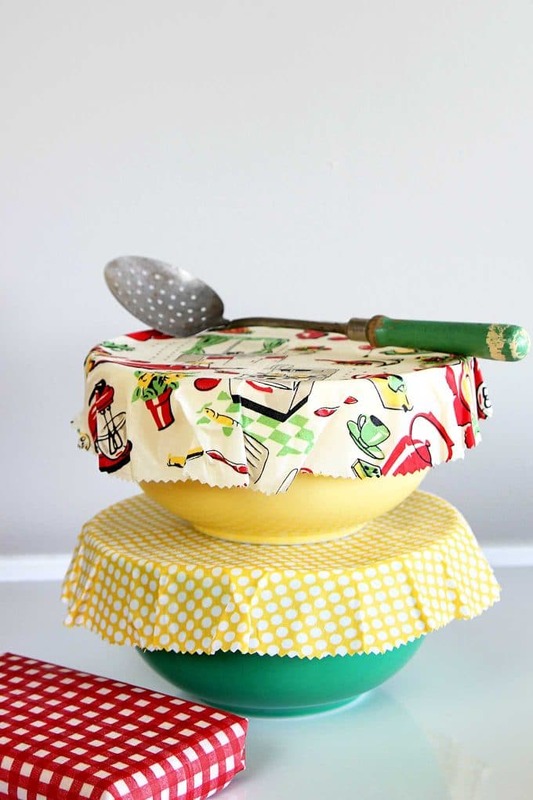 How do I wash my super cute new bowl covers and food wrap? They can be washed in cool water with dish soap and allowed to air dry. No hot water and no dishwashers, because beeswax tends to melt (remember the stove?). Can I wrap my favorite bologna up in this wrap? Nope. They are not recommended for wrapping meats, because you can’t use hot water to clean them sufficiently for possible meat bacteria. And really, do you know what they make bologna out of? Will these last 20 years? Not really, but they can last up to 1 year. At that point you can either re-coat them or make new ones. 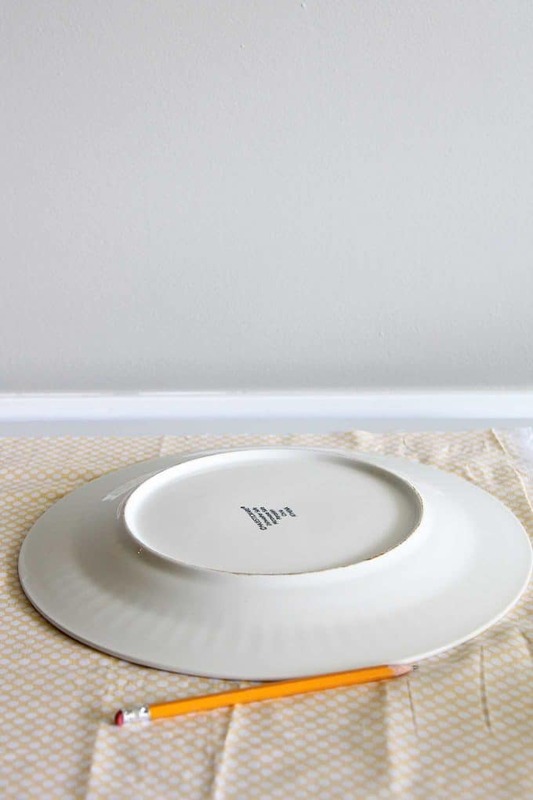 Fabric styles will change in 20 years anyhow and who wants to be wrapping your food in out-of-style fabric choices anyhow. Speaking of fabric, is there a certain type of fabric recommended for making these? I found that using a tightly woven, thin fabric works great! Thick fabric isn’t bendable enough and a loose woven fabric (cheesecloth, etc) will allow the beeswax to flake off easily. I bought my fabric in the inexpensive quilt fabric section at my local fabric/craft store. How do I store these when not in use? I wrap mine around an old aluminum foil cardboard tube for storage. So not only are you saving the environment, you’re saving the environment. 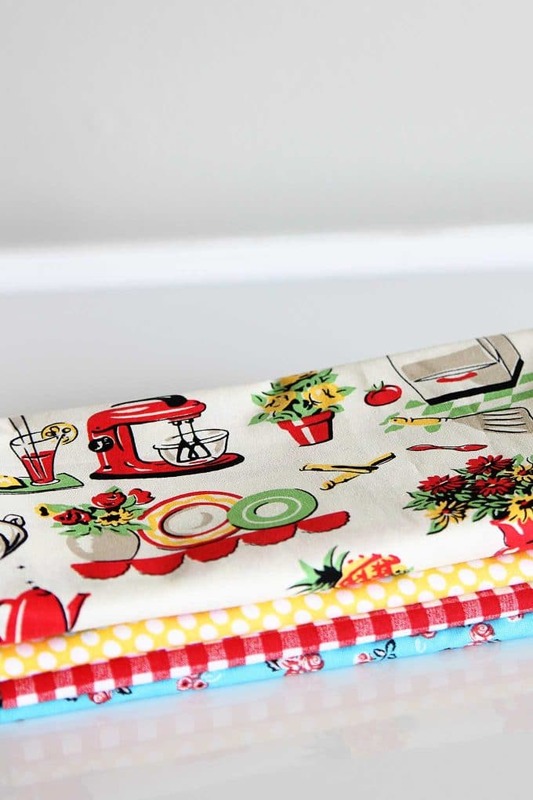 Where can I buy that rad retro kitchen fabric? Well, go back to the 90’s when rad was a word and then pop over to Hobby Lobby for the fabric along with the beeswax pastilles. Can I make bee-free vegan version? 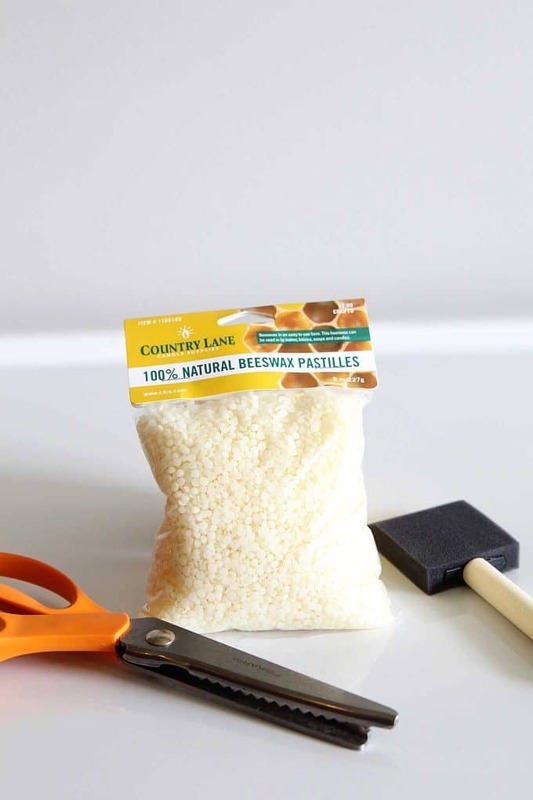 Yes, you can substitute candelilla wax for the beeswax. I love these! I’ve seen reusable covers, and they are expensive. I never thought of making them. Your fabric choices are so great looking, and I love the wonderful tutorial! Thank you! And, don’t let them lay in the sun…it’s like that stove that you mentioned earlier. You are awesome. Thank you for sharing. I saw something like this on Amazon and they were so expensive. I will try this. Love your site too. Makes me smile. Amazing! Love! Pam, you keep bringing us the most wonderful ideas! Great idea and easy to follow tutorial! Have you tried 2 layers of fabric for this project? Thinking of doing some applique projects with antique camper designs for our camping friends. This would be great. Thought of towels and pot holders but this is so cute. I have not, but I bet you could! Just make sure the fabrics are THIN. My kind of project! Easy and useful. I will share this idea with my sister. These are just the cutest things! 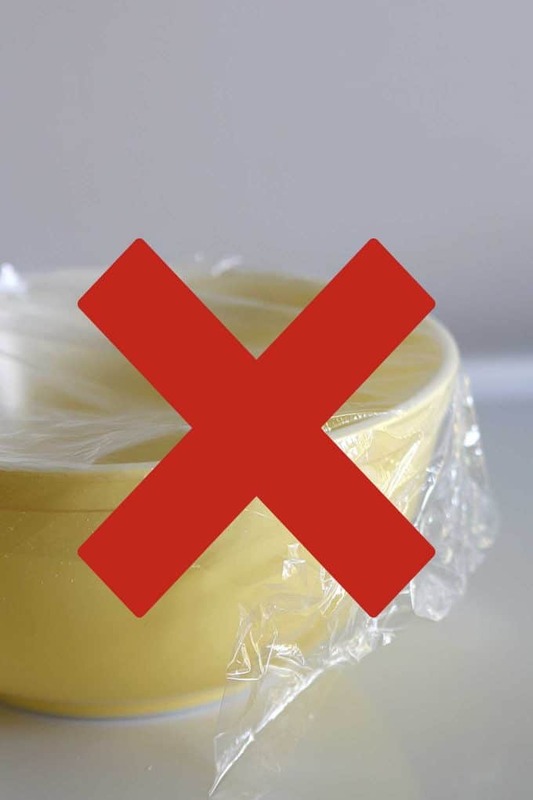 I’m afraid I’m guilty of plastic wrap….I didn’t know I was committing a terrible faux pas….LOL. The only thing I’m concerned about is that the fabric might catch fire in the oven, but didn’t happen to you, so guess it’s OK. Cute bowl covers though! I love the patterns, especially that one you illustrated with. Pam, sooo cute. Reminds me somewhat of the little “shower cap” covers for bowls! That kitchen fabric is Adorable. This is a clever use of materials. I like it alot. Oh how I love thee’s (thee’s ? ), crafting posts…let me count the ways. Crazy, awesome idea. Thanks! You make the most fun items and I thank you for sharing this great idea that I am going to give a try ! Does the waxed side face down over and around the food? Thanks. The wax actually soaks into the whole cloth, so it’s on both sides. Hi Pam, I knew to your page, but I love this idea. Anything vintage for me! But I do not understand what I do with the sandwich wrap. Did I miss a step? I think I got all excited about the pretty bowl covers I didn’t go into the sandwich wrap too much 🙂 The sandwich wrap is square so you can either use it to wrap up a sandwich (sort of like you would with wax paper back in the day) or a hunk of cheese. It can double as a bowl cover too as long as your bowl is small enough. Hi, I’m trying out making these and am having trouble .. the colours in the fabric are running. Have you had this problem? I’m sorry, I didn’t have a running problem with any of the fabrics I used. Not sure why it would run. Hi there! 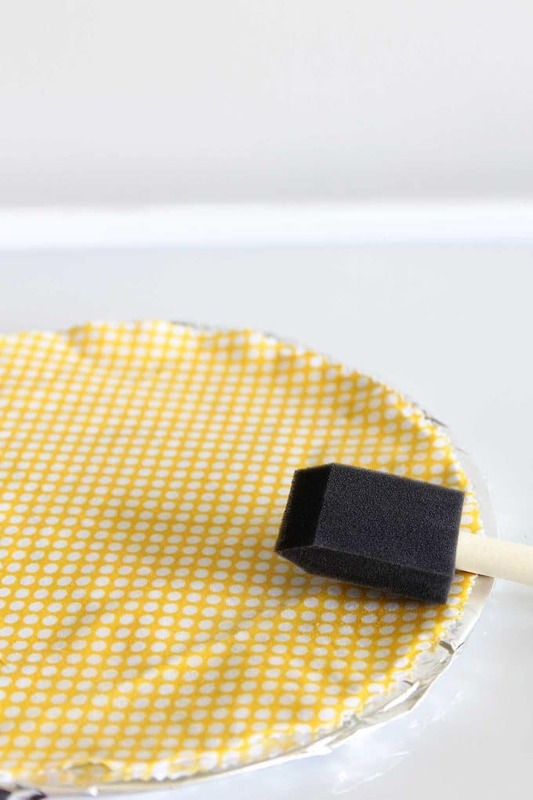 Do you use the standard “yellow” beeeswax or will it discolor the fabric? Would you recommend white beeswax? I use the 100 natural beeswax which is slightly yellow colored, but it doesn’t seem to discolor the fabric enough to make a noticeable difference. Most of the fabrics I have used have at least some white in them also. Can the bowl covers be washed if they get dirty? Would you have to redo the bee wax part after washing? Love the bowl covers! Would have never thought of doing that. So pretty and useful! This is a strange question I’m sure but wondering if it is safe to melt the beeswax in a gas oven? Can they go in the freezer. Is there anything that I can use instead of aluminum foil? I try not to use this with the links to autism and dementia. Thanks. Just saw beeswax bowl covers at a store today. They were selling for $24 for a package of two. Came home and wanted to see if I could find some that were cheaper – found your DIY video!!! I’m definitely going to try this project. Thank you! Could these be used to cover food? For instance if you were to make one and designate it only to onion and then cover the extra onion half that you may have not used in a recipe? I love this idea, but I’m concerned about food-borne illnesses. How safe is it to use this with the possibility of contamination and spread of bacteria/germs? I know these covers aren’t and cannot be washed thoroughly, and the bacteria, mold and germs on the surface will transfer to the next food item that it touches. I wrapped cheese in the one I made and no it didn’t mold, which was a plus but it did dry out. I wrapped it tight. Can you tell me how to solve this problem?